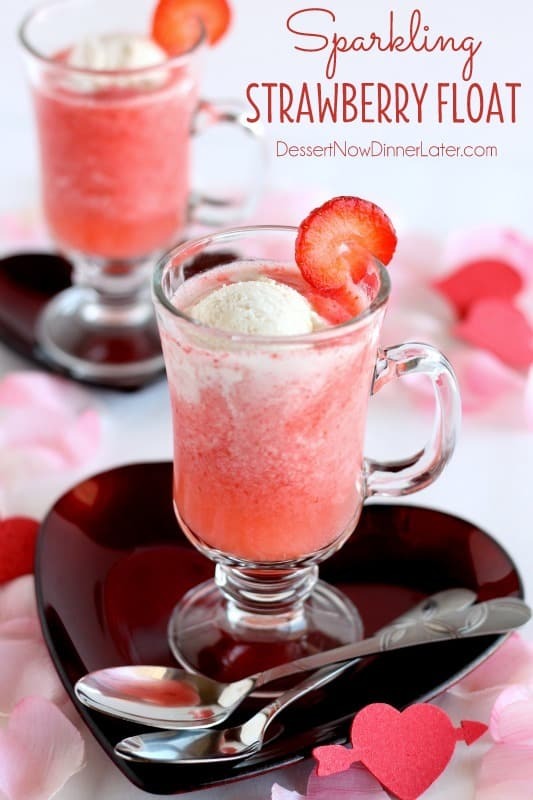 Sparkling Strawberry Float - Dessert Now, Dinner Later! I am obsessed with holiday treats, even if I am not a huge fan of the holiday. It’s just fun for me to come up with holiday themed recipes. Valentine’s Day is alright. I mean it’s a great excuse to actually go on a date with my husband, but I don’t think you have to go overboard with the decor, date or gifts. For us, it’s just a time of year to remember why we love each other. This Sparkling Strawberry Float is festive enough, yet simple to prepare. My kids loved gobbling it up! 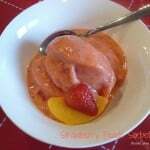 It’s basically a homemade strawberry soda using fresh strawberries all topped with ice cream. 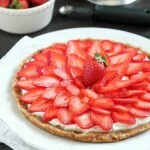 And I love fruit and cream anything! 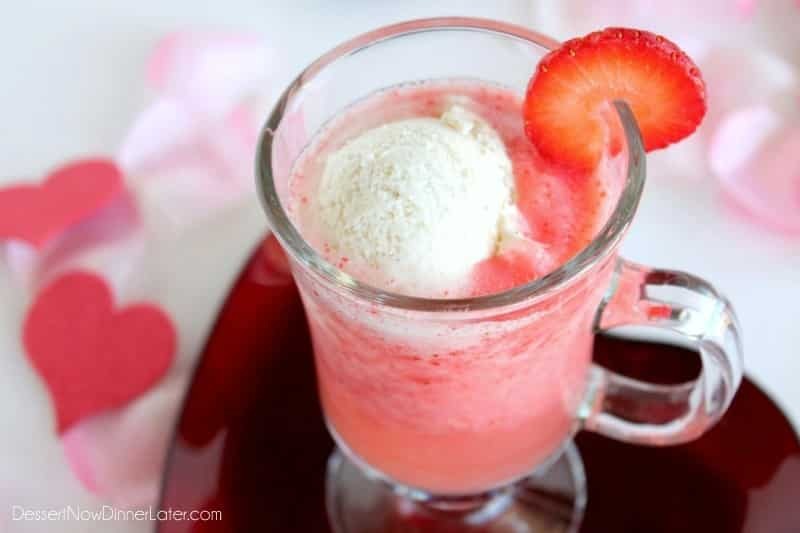 The fizzy strawberry puree with the creamy vanilla bean ice cream makes this a lovely drink or dessert, whatever you want to call it. 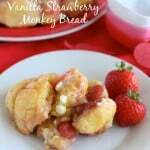 So good to eat and so easy to make! Enjoy! 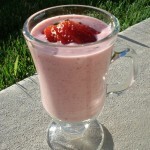 Blend the strawberries, sugar, lime juice and 2 cups of the club soda in a blender. Slowly stir in the remaining club soda, to keep the mixture fizzy. Pour mixture into glasses, top with a scoop of vanilla bean ice cream and an extra splash of club soda, if desired. MMMM! This looks so refreshing! Thanks for sharing, Pinning this! Oh these look pretty! I was searching for something fun to do with Dax on Valentines day and this would be perfect! This sounds so yummy I think I need it now! This looks so good and pretty! Perfect for Valentine’s Day! Pinning this! mmm this sounds delicious. 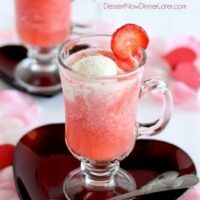 I love rootbeer floats and strawberries and cream so this is the perfect combo of both things! Thanks Brenda! It’s a fun holiday recipe, that’ for sure! These look so refreshing! Definitely going to make this to try. THis looks so refreshing! Pinning! I love how refreshing this drink looks… pinning! These are look so good. I want one.